Quiet HEPA . . . 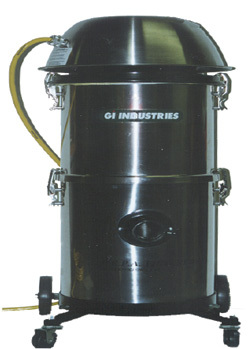 The VAC-606Q is the perfect quiet vacuum for cleaning hazardous waste in industrial environments. This product features 110v. motor (1.25 HP), 95 CFM, 88″ static lift, 45′ electric cord, 6-gallon stainless steel tank and removable dolly frame. This compact vacuum is light-weight and protable. It is great for areas that require low noise in industrial buildings or residental structures. Dimension: 36" x 16" x 16"